If your retail business has a brick-and-mortar location (or many), then you know how important physical signage can be. Signage is about far more than wayfinding or displaying product prices — a simple sign can help curb theft, increase revenues, and draw attention to featured inventory you’re hoping to offload. In other words, each and every sign that you create is an opportunity to communicate with potential customers about your products and your company. Retailers should consider using a defined style guide for their brand story when creating both permanent and temporary signage design to keep everything consistent and on brand. For more about getting started on store design and creating your brand story, check out The Secret to Telling Your Brand's Story With Immersive Retail Design. So, how do you master the art of signage design to tell your brand’s story and boost your sales in the process? Let’s examine the types of signage designs commonly used in retail stores, and further highlight their potential benefits. Outdoor Signage: Great for creating awareness of your store, and getting people interested enough to come inside. Informational Signage: Provide customers with much needed information (i.e. directions to the washroom), but also make the overall experience smooth. Persuasive Signage: Signs with a defined CTA that drive customers to make a purchase. ADA (Americans with Disabilities Act) Compliant Signage: Make your retail store inclusive and easy for everyone to navigate. Mats: A great way help orient customers within the store, and drive traffic to specific areas of interest. Good signage drives customers into the store, gives passersby a snapshot of your products and your brand, and great signage even increases sales. A well-designed sign has a clear message, an appealing look, and is placed in just the right location. Effective signage can even save you money by acting as a salesperson, directing customers to what they’re looking for and answering questions they may have. This in turn frees up more time for the team members you do have on the floor to do other tasks and help customers in other ways — saving your business time, effort, and money. Successful signs provide others benefits, including creating a path for customers to follow through your store that drives them towards inventory that you’re looking to offload. Let’s take a took at what you can do to create signs that help bolster sales for your retail business. Every sign has an ideal size. Outdoor signage should be large enough that passersby notice it on foot or in their cars, billboards need to be big enough to see quickly from afar, tabletop signage should be small enough to fit on countertops but big enough for the average person to read. So, what’s the magic recipe for designing the message on these signs? According to Design Shack, retailers should “think about lettering in terms to 10 to 100. That is 10 inches of letter height for every 100 feet of visibility.” That means if you’re creating an in-store sign that you want me to be visual from 20 feet away, the lettering should be 2 inches in height, and the frame of the sign should be designed accordingly. If your sign is graphics heavy and you need more space, then keep the lettering the same size but increase the size of the sign to accommodate the images and still maintain readability. What’s the goal of this particular type of signage? Compared to informational or entertaining signs, those that attempt to drive a sale have the hardest job. There are certain kinds of signs that catch people’s attention, including clearance sales and massive discounts. But if the goal is to drive sales for a specific product, then you’ll want to focus on the features and benefits of that item. It’s tempting to tell customers about the features and expect them to understand the benefits of the product, but it’s better to speak to the benefits of the product directly. Letting people know that this product solves a problem for them, makes their life easier, or fills a need for them or someone they love is the best way to pique their interest. 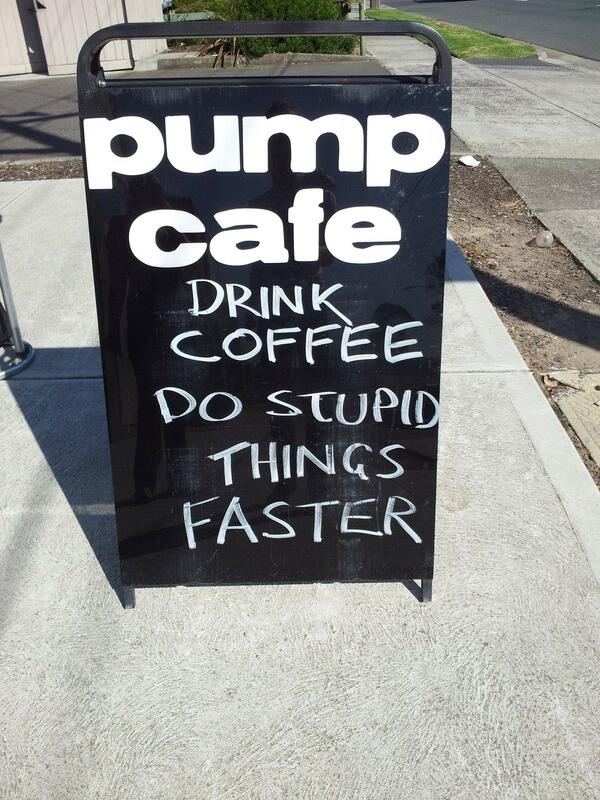 Think about walking down the street past a coffee shop. You see a sign that reads “Delicious Coffee $3.” Compared that to another sign that says “Wake Up and Tackle the Day for Only $3.” The coffee might very well be delicious, but the latter sign has a call to action that explains why you need this product right now and why you should make the purchase. Obviously it’s all in the phrasing of your message — and it doesn’t hurt to include a clear call to action that explains how your potential customers should move forward to enjoy the benefits of your product. As for the message and images that you select, the simpler the better. In the world of retail, the industry standard is that most signs should not contain more than 15 words. If you need more than 15 words to convey your message, then try to edit it and get it under that mark. Anything longer and you risk losing the attention of your audience or overcomplicating your message. If you have something like a complicated promotion that you just can’t explain on a sign, then boil the message down to one CTA to get customers interested enough to come inside and ask salespeople for more information. Once you’ve decided on your message, identify the graphics/images (if any) that are needed on the sign. Again, be short and to the point — lose any images that aren’t absolutely necessary or don’t add intrigue to the sign. People are bombarded with signs everywhere they go. When they see the same thing all the time, they start to tune it out. Keep your signage interesting and unique to stand out from the crowd. Witty signs that make people laugh are a great way to break through the noise and be eye-catching. There’s a design trend recently to move towards neutrals. Whites, beiges, and greys are ever popular in design because they represent simplicity and cleanliness. The truth is that there’s a popular emotion response to every color. Companies have been using this psychology of color to help design brand logos and signs for years. What do want your brand to represent and what do you want people to feel when they look at your signs? Do you want people to be excited about a new product? Or feel like they can trust your business and products? Ask yourself these questions during the design stage and align your signs with the emotional response you’re trying to elicit. Effective signage design should bring new customers into your brick-and-mortar location, help them navigate the store, and increase your conversions. For more tips on increasing foot traffic and sales, check out our blog Foot Traffic: How to Accurately Measure and Increase Customer Visits to Your Store. And be sure to let us know about your experiences designing successful retail signage in the comments section below.